"Words cannot express the euphoria … returning theatre to its roots in storytelling, imagination, and making tangible the impossible." "The language is enchanting and the poetry shines with an unearthly radiance." "A Child's Christmas in Wales is a Christmas show for people… who love stage enchantment without cliché or trite sentimentality. Do yourself a favor and recapture some of the innocent magic of childhood as displayed by this wonderful piece of work." 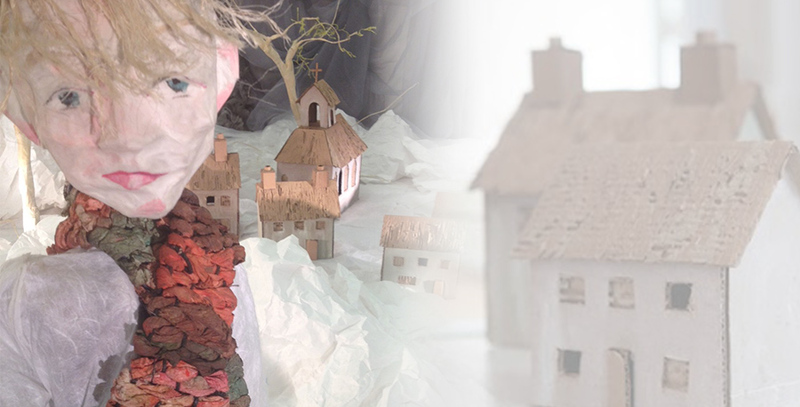 “A Child’s Christmas in Wales ” includes in-depth hands-on workshops in visual, literary, performing, and media arts. While the performance is a wonderful experience on its own, follow-up workshops allow viewers to explore the themes and concepts introduced in the performance in greater depth. Workshops can vary in length and number and can be tailored for teachers, students, performing arts groups, and topic-specific groups including: literature, sculpture, puppetry, movement, and storytelling. Cast/Collaborators: Amy Smith, Genevieve Perrier, Charlie Delmarcelle, Doug Hara. Studio Makers: Watsuki Harrington, Anna DeCaria, Dot Vile, Claire Pitts. Special Thanks: Whit MacLaughlin, Hassen Saker, Ingrid Boucher, Sara Labov, Jamie Labov.